National Geographic features this graphic illustrating migration into the U.S. from the 1850s to the present. It's definitely eye-catching, and some readers will be enticed to spend time figuring out how to read this chart. The inset reveals that the chart is made up of little colored strips that mix together. This produces a pleasing effect of gradual color gradation. The white rings that separate decades are crucial. Without those rings, the chart becomes one long run-on sentence. Once the reader invests time in learning how to read the chart, the reader will grasp the big picture. One learns, for example, that migrants from the most recent decades have come primarily from Latin America (orange) or Asia (pink). Migrants from Europe (green) and Canada (blue) came in waves but have been muted in the last few decades. Initially, the chart is disorienting. It's not obvious whether the compass directions mean anything. We can immediately understand that the further out we go, the larger numbers of migrants. But what about which direction? The key appears in the legend - which should be moved from bottom right to top left as it's so important. Apparently, continent/country of origin is coded in the directions. This region-to-color coding seems to be rough-edged by design. The color mixing discussed above provides a nice artistic effect. Here, the reader finds out that mixing is primarily between two neighboring colors, thus two regions placed side by side on the chart. Thus, because Europe (green) and Asia (pink) are on opposite sides of the rings, those two colors do not mix. Another notable feature of the chart is the lack of any data other than the decade labels. We won't learn how many migrants arrived in any decade, or the extent of migration as it impacts population size. A couple of other comments on the circular design. The circles expand in size for sure as time moves from inside out. Thus, this design only works well for "monotonic" data, that is to say, migration always increases as time passes. The appearance of the chart is only mildly affected by the underlying data. Swapping the regions of origin changes the appearance of this design drastically. Alberto Cairo introduces another one of his collaborations with Google, visualizing Google search data. We previously looked at other projects here. The latest project, designed by Schema, Axios, and Google News Initiative, tracks the trending of popular news stories over time and space, and it's a great example of making sense of a huge pile of data. The design team produced a sequence of graphics to illustrate the data. The top news stories are grouped by category, such as Politics & Elections, Violence & War, and Environment & Science, each given a distinct color maintained throughout the project. 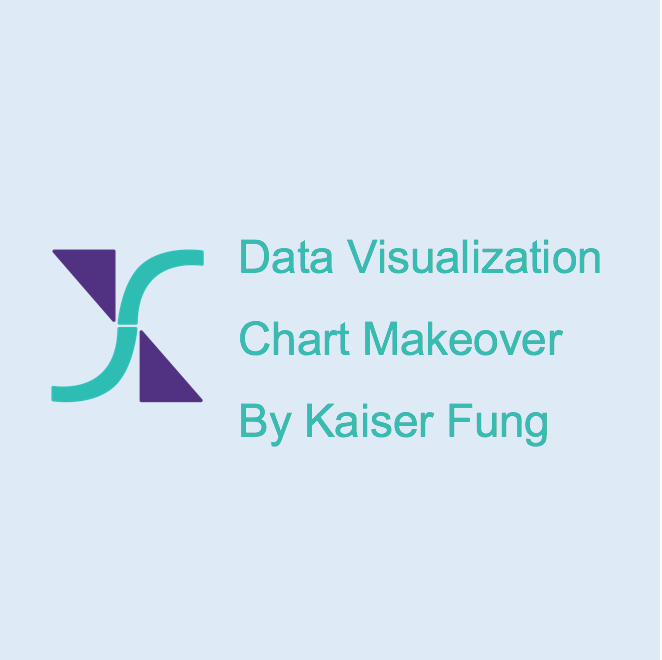 The first chart is an area chart that looks at individual stories, and tracks the volume over time. To read this chart, you have to notice that the vertical axis measuring volume is a log scale, meaning that each tick mark up represents a 10-fold increase. Log scale is frequently used to draw far-away data closer to the middle, making it possible to see both ends of a wide distribution on the same chart. The log transformation introduces distortion deliberately. The smaller data look disproportionately large because of it. The time scrolls automatically so that you feel a rise and fall of various news stories. It's a great way to experience the news cycle in the past year. The overlapping areas show competing news stories that shared the limelight at that point in time. Just bear in mind that you have to mentally reverse the distortion introduced by the log scale. In the second part of the project, they tackle regional patterns. Now you see a map with proportional symbols. The top story in each locality is highlighted with the color of the topic. As time flows by, the sizes of the bubbles expand and contract. Sometimes, the entire nation was consumed by the same story, e.g. certain obituaries. At other times, people in different regions focused on different topics. In the last part of the project, they describe general shapes of the popularity curves. Most stories have one peak although certain stories like U.S. government shutdown will have multiple peaks. There is also variation in terms of how fast a story rises to the peak and how quickly it fades away. The most interesting aspect of the project can be learned from the footnote. The data are not direct hits to the Google News stories but searches on Google. For each story, one (or more) unique search terms are matched, and only those stories are counted. A "control" is established, which is an excellent idea. The control gives meaning to those counts. The control used here is the number of searches for the generic term "Google News." Presumably this is a relatively stable number that is a proxy for general search activity. Thus, the "volume" metric is really a relative measure against this control. A reader sent me the following chart. In addition to the graphical glitch, I was asked about the study's methodology. I was able to trace the study back to this page. The study uses a line chart instead of the bar chart with axis not starting at zero. The line shows that web pages ranked higher by Google on the first page tend to have more words, i.e. longer content may help with Google ranking. On the bar chart, Position 1 is more than 6 times as big as Position 10, if one compares the bar areas. But it's really only 20% larger in the data. In this case, even the line chart is misleading. If we extend the Google Position to 20, the line would quickly dip below the horizontal axis if the same trend applies. The line chart includes too much grid, one of Tufte's favorite complaints. The Google position is an integer and yet the chart's gridlines imply that 0.5 rank is possible. Any chart of this data should supply information about the variance around these average word counts. Would like to see a side-by-side box plot, for example. Another piece of context is the word counts for results on the second or third pages of Google results. Where are the short pages? Turning to methodology, we learn that the research team analyzed 1 million pages of Google search results, and they also "removed outliers from our data (pages that contained fewer than 51 words and more than 9999 words)." How do they define "outlier"? Why do they choose 51 and 9,999 as the cut-offs? What proportion of the data was removed at either end of the distribution? If these proportions are small, then the outliers are not going to affect that average word count by much, and thus there is no point to their removal. If they are large, we'd like to see what impact removing them might have. In any case, the median is a better number to use here, or just show us the distribution, not just the average number. It could well be true that Google's algorithm favors longer content, but we need to see more of the data to judge. Vox featured the following chart when discussing the rise of resistance to President Trump within the GOP. The chart is composed of mirrored bar charts. On the left side, with thicker pink bars that draw more attention, the design depicts the share of a particular GOP demographic segment that said they'd likely vote for a Trump challenger, according to a Morning Consult poll. This is the primary metric of interest, and the entire chart is ordered by descending values from African Americans who are most likely (67%) to turn to a challenger to those who strongly support Trump and are the least likely (17%) to turn to someone else. The right side shows the importance of each demographic, measured by the share of GOP. The relationship between importance and likelihood to defect from Trump is by and large negative but that fact takes a bit of effort to extract from this mirrored bar chart arrangement. The subgroups are not complete. For example, the only ethnicity featured is African Americans. Age groups are somewhat more complete with under 18 being the only missing category. The design makes it easy to pick off the most disaffected demographic segments (and the least, from the bottom) but these are disparate segments, possibly overlapping. One challenge of this data is differentiating the two series of proportions. In this design, they use visual cues, like the height and width of the bars, colors, stacked vs not, data labels. Visual variety comes to the rescue. Also note that the designer compensated for the lack of stacking on the left chart by printing data labels. When reading this chart, I'm well aware that segments like urban residents, income more than $100K, at least college educated are overlapping, and it's hard to interpret the data the way it's been presented. I wanted to place the different demographics into their natural groups, such as age, income, urbanicity, etc. Such a structure also surfaces demographic patterns, e.g. men are slightly more disaffected than women (not significant), people earning $100K+ are more unhappy than those earning $50K-. Further, I'd like to make it easier to understand the importance factor - the share of GOP. Because the original form orders the demographics according to the left side, the proportions on the right side are jumbled. The widths of the line segments show the importance of each demographic segment. The longest line segments are toward the bottom of the chart (< 40% likely to vote for Trump challenger). I had a lot of trouble processing this chart. The two lines are labeled "original price" and "in 2014 dollars". The lines show a gap back in the 1970s, which completely closes up by 2014. This gives the reader an impression that the problem has melted away - which is the opposite of the designer intended. The economic concept being marshalled here is the time value of money, or inflation. The idea is that $3.50 in 1971 is equivalent to a much higher ticket price in "2014 dollars" because by virtue of inflation, putting that $3.50 in the bank in 1971 and holding till 2014 would make that sum "nominally" higher. In fact, according to the chart, the $3.50 would have become $20.46, an approx. 7-fold increase. The gap thus represents the inflation factor. The gap melting away is a result of passing of time. The closer one is to the present, the less the effect of cumulative inflation. The story being visualized is that Disney prices are increasing quickly whether or not one takes inflation into account. Further, if inflation were to be considered, the rate of increase is lower (red line). What about the alternative story - Disney's price increases are often much higher than inflation? We can take the nominal price increase, and divide it into two parts, one due to inflation (of the prior-period price), and the other in excess of inflation, which we will interpret as a Disney premium. Most increases are small, and stay close to the inflation rate. But once in a while, and especially in 2010s, the price increases have outpaced inflation by a lot. Note: since 2013, Disney has introduced price tiers, starting with two and currently at four levels. In the above chart, I took the average of the available prices, making the assumption that all four levels are equally popular. The last number looks like a price decrease because there is a new tier called "Low". The data came from AllEars.net.